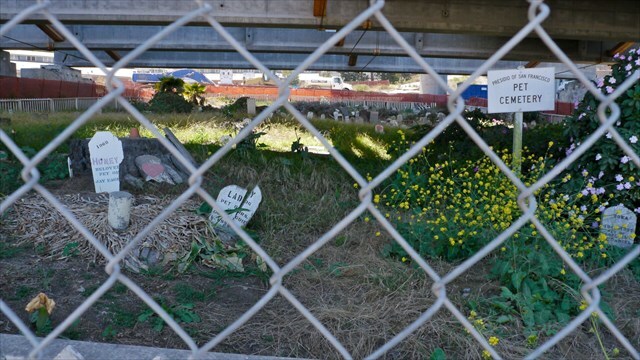 This cache commemorates the Presidio Pet Cemetery and the falsework that has protected it since 2010 and will protect it until 2015. It is part of a larger project by artists Finley+Muse entitled Falsework. This cache has been placed by and will be maintained by j+j-jcf, j+j-jhm, and PresidioTrust. 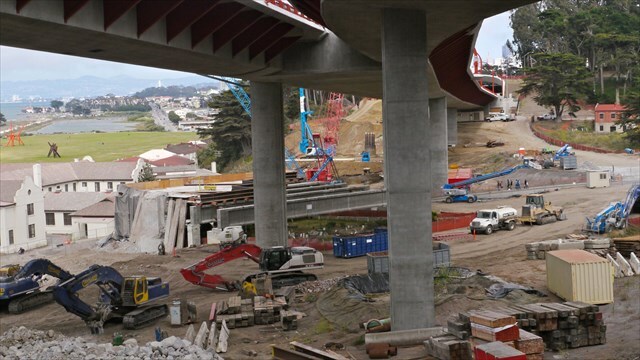 Falsework consists of temporary structures used in construction to support, protect, provide scaffolding for, or shore up other architectural components of the construction zone. 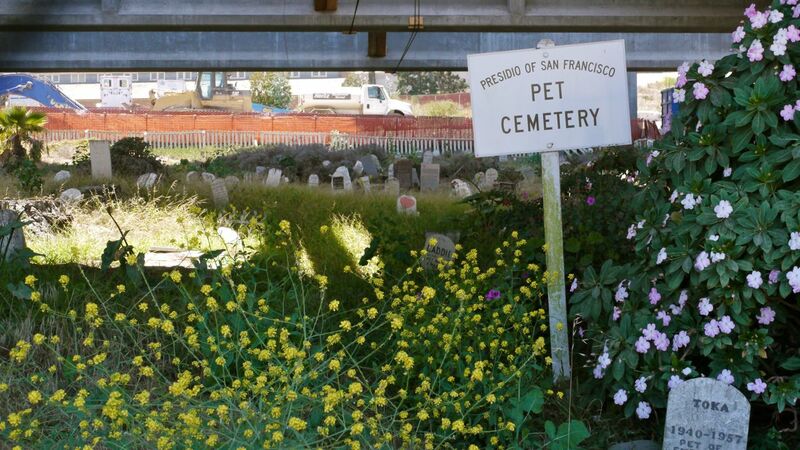 The Presidio Pet Cemetery, nestled under Doyle Drive at the foot of McDowell Avenue, is the final resting place for more than 420 dogs, cats, birds, hamsters, lizards, and goldfish that once lived on the military base at the Presidio. Grave markers date back more than fifty years, when 2,000 families were stationed there. The base was closed in 1996 and is now a national park. 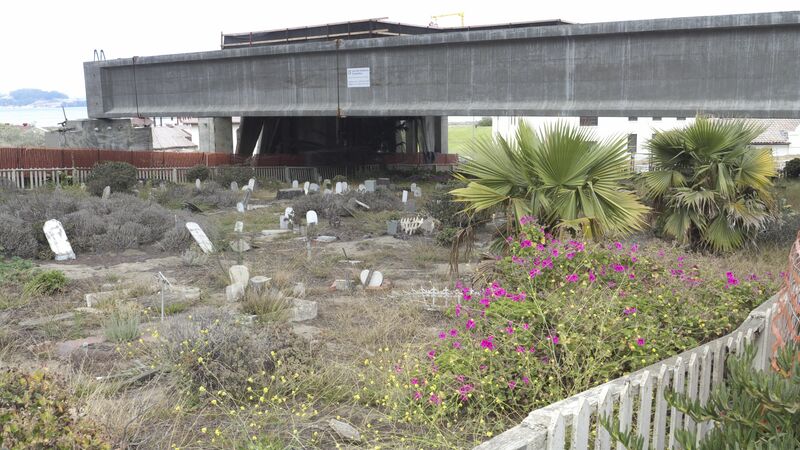 While Doyle Drive (the ramp that leads to the Golden Gate Bridge) is being replaced overhead, the Pet Cemetery is protected by falsework, nets, and fencing and is currently inaccessible. After construction ends in 2015, the site will be restored and once again serve as a reminder of what military family life was like at the Presidio. In cooperation with the Presidio Trust, Finley + Muse have created Falsework, the Falsework cache, as well as a series of paired travel bugs. These bugs, which depict living pets and their owners, will be separated and placed in different caches outside the Presidio. The public is invited to find and reunite these pairs, visit the Pet Cemetery with them, and then place them in the Falsework cache located nearby. Park at the lot located at the intersection of Cowles St and McDowell Ave. Walk up Cowles to the overlook. You will find the cache near there. Enjoy the cache, the trackables, the Pet Cemetery, and the falsework built to protect it. Read Finley+Muse blog posts tagged falsework. Presidio Pet CemeteryDuring the Doyle Drive construction project, the Presidio Pet Cemetery will be closed to the public. Photo taken 07.15.13. View of the Pet Cemetery and falseworkView of the Pet Cemetery and falsework from the cache location. Photo taken 07.15.13.